Lift parts, boxes, and material easily. Ergonomic Partners handles a wide variety of ergonomic scissor lifts, ergonomic lift tables, work positioners, pallet and bin tippers and other equipment for container handling, vertical lifting and work positioning. This material handling equipment is designed to improve worker productivity while reducing the potential for workplace injuries. 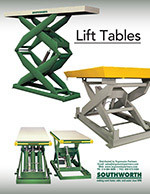 Our product offerings include: scissor lift tables, container tilters, pallet level loaders, pallet trucks, self leveling lift table, pneumatic lift tables, turntables and other palletizing equipment. We also handle custom coil and roll handling equipment, roll on level loaders, dock lifts, vertical conveyors, portable ergonomic scissor lifts and manual lifter transporters. Combining lift assist equipment with a work positioners in a production environment, can drastically improve safety and productivity. No more heavy lifting, awkward bending or uncomfortable working postures. 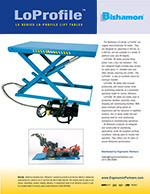 Learn how these products can help you in our pallet jack lift table case study. 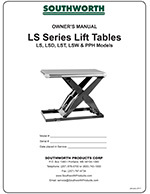 Designed from the ground up, the Bishamon LK-Series work positioners introduce a new concept in lift table manufacturing. 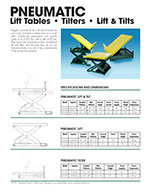 LK pallet lift tables are produced in 3 capacity ranges and 8 models to handle most of your lift table needs with fast delivery. 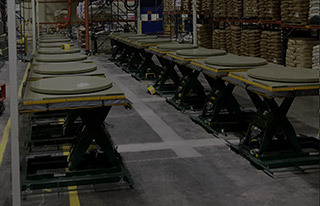 LK lifts increase productivity and reduce worker strain in today's harsh industrial environments by eliminating unproductive lifting, bending and stretching that ultimately leads to worker fatigue and injuries. Bishamon's LoProfile electro-hydraulic lift tables offer up to 4,000 pounds of lifting capacity with a convenient low profile. 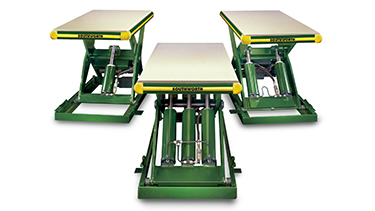 These tables feature, optional foot operated control, lowered heights of 2.9 inches to 4.3 inches and a variety of platform sizes and lift heights. With the optional approach ramp accessory they are ideal for pallet trucks, products, parts, carts or other portable industrial equipment. LX-25S 550 lbs. 2.9 in. / 20.9 in. 23.5 x 32.5 in. 18.0 in. LX-25L 550 lbs. 2.9 in. / 30.0 in. 23.5 x 40.0 in. 27.1 in. LX-50S 1,100 lbs. 2.9 in. / 20.9 in. 23.5 x 32.5 in. 18.0 in. LX-50L 1,100 lbs. 2.9 in. / 30.0 in. 23.5 x 40.0 in. 27.1 in. LX-100W 2,200 lbs. 3.3 in. / 38.6 in. 34.5 x 51.0 in. 35.5 in. LX-100N 2,200 lbs. 3.3 in. / 38.6 in. 24.5 x 51.0 in. 35.5 in. LX-200WM 4,400 lbs. 4.3 in. / 39.4 in. 45.5 x 61.5 in. 35.1 in. LX-200N 4,400 lbs. 4.3 in. / 39.4 in. 33.5 x 55.5 in. 35.1 in. LX-200WL 4,400 lbs. 4.3 in. / 39.4 in. 45.5 x 81.0 in. 35.1 in. All of our lifts can be configured with a wide variety of standard options and accessories. The wide range of power options, controls, tabletops, and base configurations that can be specified for each of the many basic sizes gives the user an almost unlimited choice of variations. 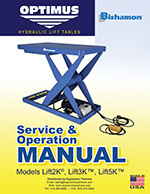 Features include: Contoured Legs, Comfort Edge Design, Lubricated-for Life Bushings, Heavy-Duty Torque Tubes and Hoses, Tell-Tale Return Hydraulic Fluid Line, Oversize, Low-Pressure Hydraulic Cylinders, Adjustable Flow Control, Built-In Safety Chock, and Wear Indicating Rollers and Roller Retainers. 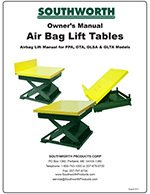 Southworth Scissors Lifts are designed and manufactured to meet or exceed ANSI MH29.1 Safety Requirements for Industrial Scissors Lifts. The new EZ Loader now handles loads from a minimum self leveling weight of 250 pounds up to a maximum self-leveling weight of 3,500 pounds with a maximum load weight of 4,000 pounds. To make it even better, a three position adjustable knob was added that allows adjustment of the collapsed capacity without changing the air pressure. 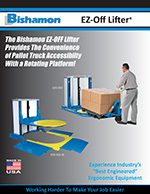 Bishamon EZ Loaders are true ergonomic tools in every sense of the word. They are designed to eliminate worker bending by automatically raising and lowering pallets during loading or unloading without the use of mechanical springs. 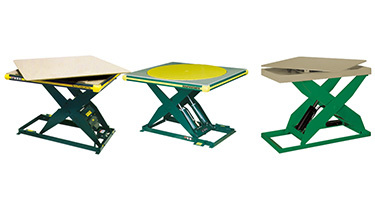 EZ Loaders also allow easy pallet rotation so the worker does not have to reach or strain. 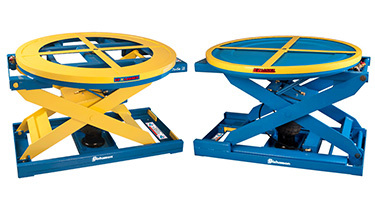 As the load weight changes, this Bishamon lift table automatically adjusts, keeping the top of the load at a convenient working height. The patented pneumatic operating system found only in the EZ Loader has proven to be the top choice of industry professionals worldwide. EZ Loader 4,000 lbs. 20.0 in. 10.5 / 30.5 in. EZ X Loader 4,000 lbs. 20.0 in. 9.8 / 29.8 in. 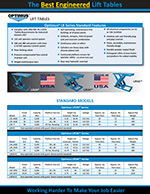 EZ Loader-SS 4,000 lbs. 20.0 in. 10.5 / 30.5 in. 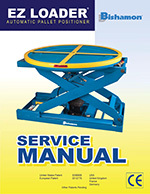 EZ-Loader and EZ X Loader have a standard powder coated finish and 43 inch diameter rotator ring. EZ Loader-SS is grade 304 stainless steel with an electro-polished finish. EZU-15 1,500 lbs. @ 90 psi 20.0 in. 9.6 / 29.6 in. EZU-15-R 1,500 lbs. @ 90 psi 20.0 in. 10.6 / 30.6 in. Ideal for use anywhere that shop air is available. Capacities up to 4,000 pounds. No hydraulic fluid means no risk of contaminants in the production process. Specifications: Air -80 psi/15 cfm, Elevating Time - 15 secs (empty). GLSA2-24 2,000 lbs. 8 / 32 in. 36 x 48 in. GLSA4-24 4,000 lbs. 8 / 32 in. 48 x 48 in. 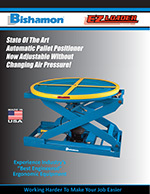 The Bishamon EZ Off Lifter pallet positioners are the ultimate ergonomic solution for loading or unloading pallets in applications when loads are transported with a pallet truck. 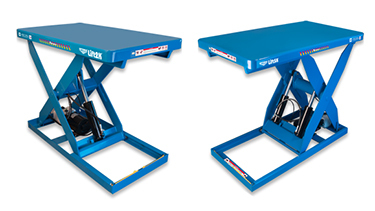 These revolutionary pallet lift tables provide the answer for maintaining the load at a convenient working height. 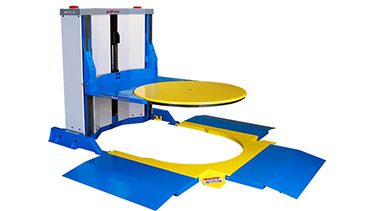 Our Bishamon lifts also provide easy pallet rotation and near side loading to eliminate excessive lifting, bending, and stretching. 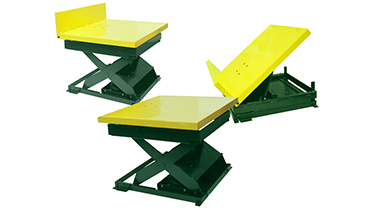 These pallet lift tables are electro-hydraulic operation and available in a free-standing front access model, and a bolt-down model with ramp access from three positions. EZO-25E 2,500 lbs. 1.75 / 30 in. 44 x 48 in. EZO-25E-3S 2,500 lbs. 1.75 / 30 in. 44 x 48 in. Ergonomic Partners is a distributor for Southworth and Bishamon scissor lifts; serving clients from coast to coast, Canada, Mexico and especially focused in the states of Missouri, Illinois, Indiana, Kansas, Arkansas, Mississippi, Nebraska, Tennessee, Kentucky, Iowa, and Oklahoma.